(Reuters) - (September 25, 2012) A U.S. appeals court has reversed itself (yesterday September 24, 2012) and found that the Army Corps of Engineers cannot be held liable in property owners' lawsuits over flood damage during Hurricane Katrina. More than 400 property owners had filed lawsuits following the August 2005 hurricane, many targeting the Corps of Engineers. The plaintiffs had alleged the Corps of Engineers delayed armoring the Mississippi River-Gulf Outlet shipping channel against flood damage due to incorrect scientific decisions rather than public policy considerations. In an unusual move, a three-judge panel of the 5th U.S. Circuit Court of Appeals in New Orleans on Monday withdrew its earlier ruling in March that had been in the plaintiffs' favor. Monday's ruling came after the federal government sought review of the panel's earlier decision by the full appeals court. Judge Jerry Smith, writing for the court, said the Corps of Engineers is immune from being held liable for property damage under the so-called "discretionary function exception" to the Federal Tort Claims Act, which governs litigation against the U.S. government. 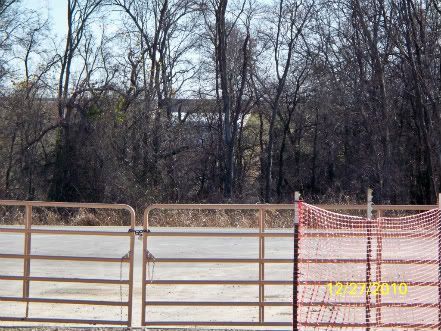 So, in 2010, Chesapeake Energy drilled and fracked within 850 FT. of the Joe Pool Lake Dam and Spillway! OOPS. USACE later tells our community, "We didn't know Chesapeake planned to do this." Hmmmm...Is this 1) USACE using their discretion to NOT KNOW; 2) USACE not knowing their own regulations; and/or 3) Chesapeake Energy using the City of Grand Prairie, TX, a church with an ever-changing name, homeowners who have no idea what's going on, AND the United States Army Corps of Engineers ~ Was/Is this Chesapeake using all these parties to make it appear well and good to do as they Da** well please?? That Jury is clearly still out (far out) on this one. Meanwhile, let's refresh our memories and re-read our story from September 25, 2011 (exactly one year ago today, ironically ) about all the myriad possibilities. Amen. Gov. Perry selling Arlington, TX to Chinese Investors? Was this really a news story? Arlington is referred to as a "mature" city!! Link to the Story and Video. Labels: Arlington TX, China, Exporting Shale Gas, Governor Rick Perry, Investments, LNG, Third World Countries. 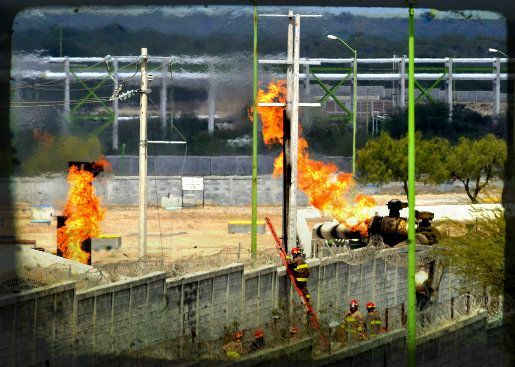 CIUDAD VICTORIA, Mexico (AP) — A big fire erupted at a natural gas pipeline distribution center near Mexico's border with the United States on Tuesday, killing 26 maintenance workers and forcing evacuations of people in nearby ranches and homes. Mexico's state-owned oil company, Petroleos Mexicanos (also known as Pemex) initially reported 10 deaths at the facility near the city of Reynosa, across from McAllen, Texas. Later, the death toll was raised to 26, including a man who was run over when he rushed onto a highway running away from the facility. Pemex said at a news conference Tuesday night that the fire was extinguished in 90 minutes and the pipeline was shut off. The pipeline carries natural gas from wells in the Burgos basin. Company executives said there was a gas leak, followed by an explosion, but the precise cause had not been determined. "Why there was such leak is something that must be investigated," said Carlos Morales Gil, Pemex's director of exploration and production. Follow these easy steps to download the Silverlight application to your MAC: Click here for how to stream a meeting on my MAC. And here's another link to some additional info if you have trouble viewing the video: Additional Info. Click here for the link to the June 5, 2012 Arlington, TX City Council Meeting. Then scroll over to 57:08 (57 Minutes, 08 Seconds) for the Rocking Horse Drilling Site Agenda Item Discussion from the citizen of South East Arlington, TX. She talks about "being hushed," at the May 31, 2012 Community Meeting conducted by Chesapeake, the likely Statewide Rule 37 Spacing Exception for mineral owners on this leasehold AND unpaid royalties for Chesapeake's Fulson site in her own neighborhood. Click here for the link to the June 5, 2012 City Council Meeting. Then scroll over to 53:27 (53 Minutes, 27 Seconds) for the Rocking Horse Drilling Site Agenda Item Discussion from the community leader about the "tremors." (*Updated*) See the comments, please. 100 Years of Shale Gas? Think Again. Now, click here to see a story on Bluedaze about shale gas royalties. Ms. Rogers writes for the Energy Policy Forum. Here's a little background on Ms. Rogers. We thank her for explaining it all so well.